I have cooked BBQ ribs many times before, but I had never gotten around to trying my hand at cooking smoked ribs. So I recently decided to give it a go and read up on how to properly smoke meat and/or fish. Turns out that cooking smoked food is not as difficult as I had originally thought it was. All you really need to do is cook your food over an indirect heat source rather than over a direct heat source; basically put the meat next to the hot coals not directly over them. So, here’s what I did. I placed an aluminum foil divider upright in order to divide my Weber BBQ into 2 sections. The I put the coals on the right side of my small Weber BBQ. Then I put the grill on as normal. I attached a small metal strainer about 2 inches in diameter to the bottom of the grill; this strainer is where the wet hickory chips will be placed. After the coals were ready (about 15 minutes) I put the wet hickory chips (they need to soak for about 30 minutes) into the small strainer and placed the grill onto the BBQ. Meat goes on left side of the grill and directly over the strainer and wet chips I placed a small aluminium tray filled 3/4’s with water. Place the cover on the BBQ and open the vents about 1/2 way. Ideally you want the temp. inside the BBQ to run at about 110 degrees C; adjust the air intake and air outtake vents accordingly to achieve the desired temp. The hickory chips and tray of water are key to the smoking process. The hot coals heat the wet hickory chips to produce a wonderful smelling hickory smoke. This smoke then rises and mixes with the hot water vapor from the water in the tray that is heating up. 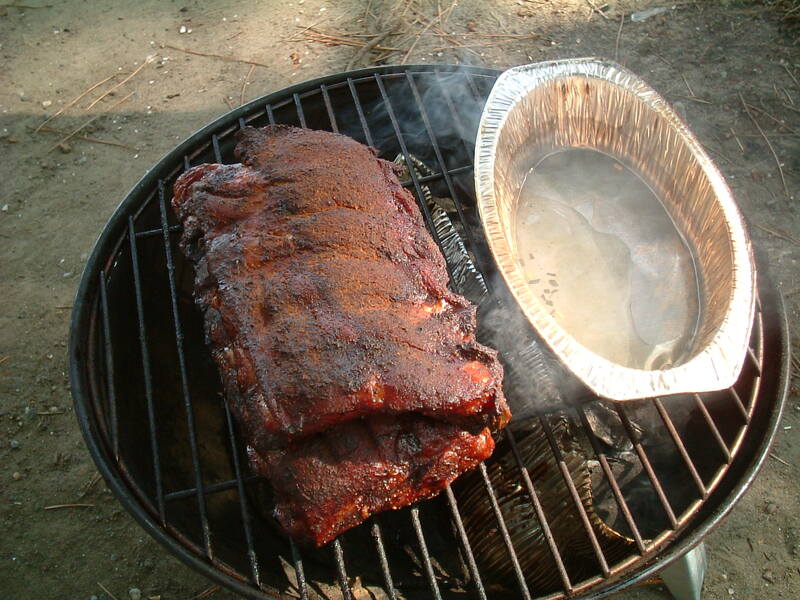 This smoky water vapor then engulfs the meat and cooks it slowly over time. Time is also a key factor as you are going to need a minimum of 3.5 hours to properly smoke your ribs. You will need to continuously replace the wet hickory chips over the course of those 3.5 hours. Each batch of hickory chips lasts between 15 and 30 minutes; the larger the chips the longer they will last. You will know it’s time to replenish the wet chips when smoke has stopped coming out of the top air vent. I have now cooked both smoked BBQ ribs as well as smoked BBQ chicken and I will never go back to the plain old BBQ again; smoking the meat adds a delicious extra dimension of taste to the food that you just can’t get with a normal BBQ process. Trust me the extra cooking time is worth the wait. 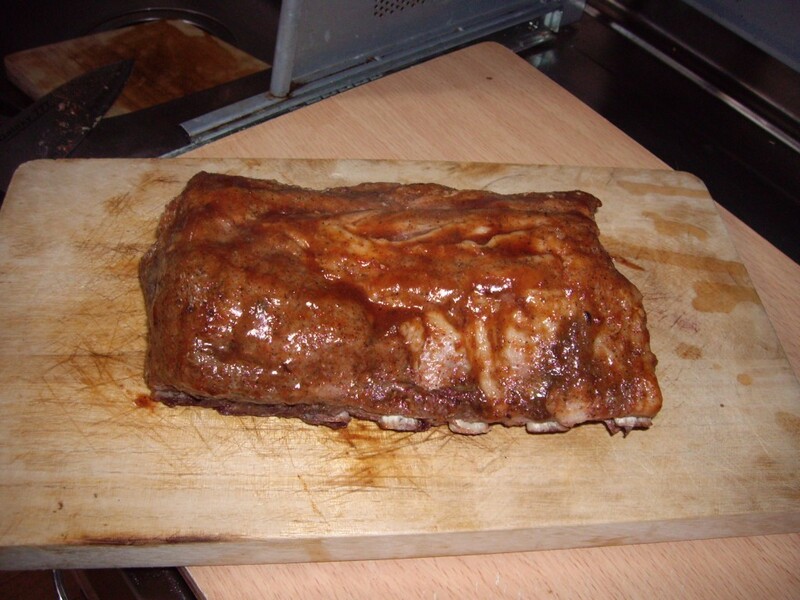 Below I have listed a very basic BBQ smoked rib dry rub recipe and mop (sauce) recipe. I have also included a pic of what BBQ ribs look like after a normal BBQ cooking process; notice how much darker and smokier the smoked ribs appear than the regular BBQ ribs do. Stay tuned for a great Japanese style Nabe recipe that’s easy and great to cook during those crisp Autumn months. Great Love your blog thanks for sharing it with everyone.